Intimidation is a common mental barrier for hockey players. When you intimidate yourself (also called self-intimidation), you make comparisons to your opponents or teammates. You make negative comparisons or think about how you’re not as good, fast or strong as your teammates or competitors. This can make you feel inferior and cause you to psych yourself out. Self-intimidation is one of the most difficult mental game challenges to overcome. You can ignore what others say, but it’s not easy to escape your own thoughts or doubts! How do you know if you’re intimidating yourself? Below are a few signs you might intimidate yourself. You focus on others thinking about their weight, size, brawn and confidence. You have doubts about playing well when you think your competitors or teammates are better than you. You are in awe of the situation or hoopla of the competitive environment. You feel inferior to the competition or teammates and make comparisons. You’re afraid of embarrassing yourself by making mistakes. You feel that you don’t belong at the game or with a certain team. How can you overcome intimidation? One option to overcome self-intimidation is to focus on your own game. If you’re intimidated, you likely focus too much on competitors. If you’re thinking too much about your competitors, focus on your own pregame warm-up routine. Think about your own strategy and preparing mentally for the upcoming game. If you make comparisons to your teammates, instead focus on your own strengths. Think about what makes you feel confident. You might remind yourself of your work ethic, ability to perform well under pressure or the best aspects of your game. 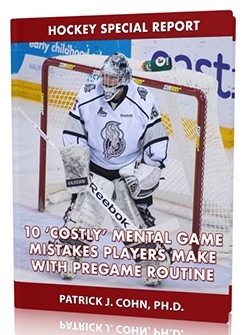 Your hockey psychology tip is to stop making comparisons. Focus on your own preparation before the game and remind yourself of the strengths in your game. Your information is very helpful, Thank you. My challenge is very specific. My son is a late bloomer. He has been taking crap for years. He has very quickly gone from about 5’4″ 150 pounds of flab, to 5’10” 185 pounds of muscle. He is squating 300 plus pounds and his growth has only begun. The problem is, he is not able to see how strong and fast he has become and is still avoiding contact. I think he still sees himself as the pudgy kid the other boys picked on…on the ice and off. What kinds of things can I do to help him. What can he do to help himself. He loves to read, can you suggest a book that might help? Help him focus on his strengths and talents. You might try The Confident Athlete or we’ll also have The Confident Sports Kid out soon. My son is a 10 year old playing defense on a travel hockey team. Last weekend he scores the winning goal in a playoff game in overtime. The next weekend the game goes into overtime and he kind of cracked under the pressure and didn’t want to go out on the ice. He said his stomach hurt and he was nervous of making a mistake. We talked after the game and I explained to him we all get anxious but sports should be fun and even in life if you make a mistake we learn from it and move on. My question is how do you help a kid at this age channel his anxiety in pressure situations. I think he felt pressure to carry the team again. You want him to understand that hockey is a team sport and others don’t expect him to be the star every game. Hello. i am kara. im in a hockey class and we are doing our first full-ice game next week. Im not the biggest toughest person out there, and a lot of times thats what holds me back from really showing who i am. Can u please tell me how to improve my confidence ? Focus on your talents instead of what you don’t have. For example, are you quick on your skates? Hi. My son is a first year Bantam player. He is a very talented skater…very fast! He has good hands and is not afraid to hit/be hit. He was recently the last player cut from the “AAA” team in our area. My son’s problem is that he doesn’t finish! He seems afraid to take a shot on anything less than an almost empty net. He “handles” the puck towards the goalie, driving very hard and then just fizzles, and does not produce. Why would such a kid, so talented have such a hard time scoring goals? He should be amongst the top point earners on his team but has been having such a hard time. Is this a confidence issue? I suspect it’s more about the fear of making mistakes and what others might think than confidence. You might also consider that he does not want to be the top scorer if it mean other not liking him or being jealous of him. This is more rare, but just a thought for you. Hi, my son is 10 years old and for the last two seasons he has started off strong and gives his all. Then later in the season he just doesn’t seem to try. He is a good player and we know that he can do better at games. What can we do or say. It is frustrating to watch a game and not say anything. We don’t know if he is just being lazy or if something else is bothering him. We were thinking of telling him if he doesn’t try harder he will miss his next game. I know he loves hockey, I don’t know what else to do. Hello, I’m Liam and I play bantam tier 1 hockey. I’m a second year and at 5’10” 155lbs I’m not small. At the begging of the season I was excited to play, couldn’t wait to get on the ice and wanted to score really badly, I had fun! Now its the end of the season and my production has gone down, I don’t believe I’m any good anymore. My father (and coach) tells me to just take the puck and skate with it and that I can beat anybody. I just don’t believe I’m any good anymore, I don’t have any cofidence whatsoever. I’m desperate. My father claims that I am my worst enemy and that I’m self destructing. Any helps, tips, advice or recommendations would be greatly appreicated. Any books would be cool too, thanks. 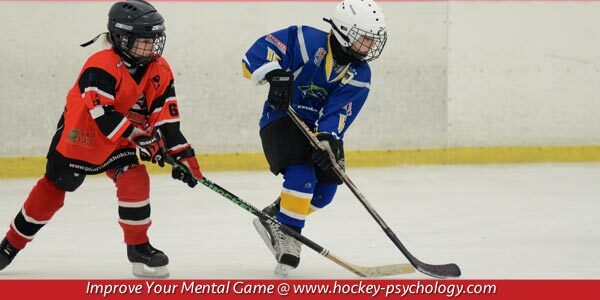 hi I am a 11 year old hockey player I just finished spring hockey and by each game I seemed to lose confidence ! My production went down every game ! I think I am as good as any player in it ! I always though find myself comparing and believing I am bad ! I don’t know what to do I am very concerned with my wconfidence . I find myself questioning “how come I can’t score “. And I know I am capable of big goal scoring numbers. I find myself getting easily frustrated and then I become ignorant and can’t make sense of myself. This confidence really is effecting my play! You might want to look into The Confident Sports Kid CD program. But you want to stop making comparisons to others and instead focus on your own talents. I play in the toughest tier of highschool hockey in new jersey where plays like James Van Riemsdyk, Kyle Palmieri, Kenny Augostino, and Joakim Ryan have come from. I believe that i have the talent to one day be in their positions in hockey. However, currently I definitely lack something in my mental game that holds back my skills. My skill set is that of a Junior A player. I do not think my problem is confidence because I know i can accomplish my goals, but when in competition my skills rarely come through consistently, and I feel I hardly ever play at my best. Any advice would be much appreciated. It might be trust in your skills… But what is holding your back? Are you afraid to make mistakes? Are you worried about what the coaches think? You have to start here. How to motivate a hockey player to play with intensity and speed on a weaker team. My 14 year old is top of the province and played up all his life. He loved the competition, the challenges and had great succes. Now, they want him to dominate his own age group but he’s just not showing up. They want him to take the weakest team of the division and carry them and also perform at his best and show his talent. He is ready to give up being a captain only to play up a level again.